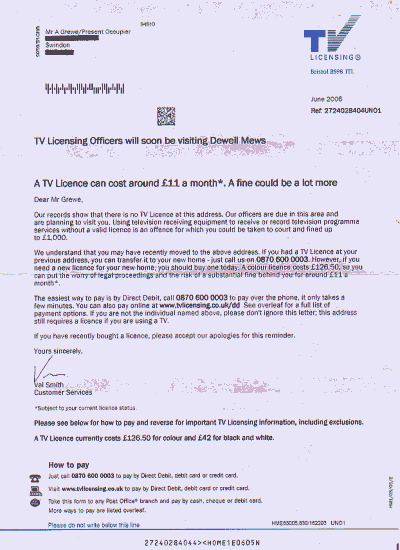 Regular readers of this blog might be wondering what is going on with my good friends from TV Licensing. Where should I start? At least Val Smith hasn't forgotten me, instead of Dear Owner/Occupier she addresses me with Dear Mr Grewe . I think we're off to a good start. She's also quite helpful: Our records show that there is no TV License at this address. That's good to know, I was getting worried I might have bought one by accident. Don't want to waste money, do I? Our officers are due in this area and are planning to visit you. Oh, thanks for letting me know. Better tidy the flat and clean up a bit, don't want to create a bad impression, do I? Living room could do with a bit of vacuuming. We understand that you may have recently moved to the above address. Val, now you really disappoint me, after such a good start! You've been sending me letters since September 2003, have you really forgotten all those letters? OK, not all were from you, but don't you talk with your TV Licensing Enforcement Managers ?